The Business Services Filing Center maintains records of all the business entities which are registered with the Secretary of State of Kansas. However, the Kansas Secretary of State doesn't register fictitious names, proprietorships, trademarks or trade names. Entities registered and recorded in the Center include Corporations, Limited Liability Companies, Limited Companies, Limited Partnerships and Limited Liability Partnerships. 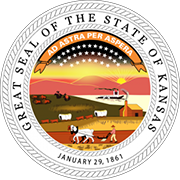 The Kansas Secretary of State facilitates an online tool where users can search for business entities registered with the Secretary of State of Kansas. Below is a step by step guideline on how to use the Kansas business search page. 1. The first step is to access the Kansas business search page by clicking here. The link will take you to the Business Entity Search Station (the page looks like the screenshot below). 2. On the next page, click on the first bullet point "Business Entity Database". The page which appears looks something like the screenshot below. 4. For this example we will be searching by business entity name. 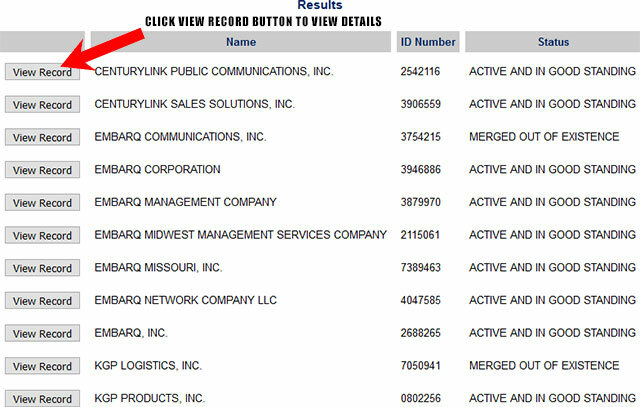 Go ahead and click on "By business entity name" and type in the name "Embarq" in the "Name of Business" field. (see the screenshot below for reference). 5. Click on the "Search" button. The Results Page will then appear (it will be similar to the screenshot below). 6. Click on the "View Record" button to access more information about the entity. 7. If you're the owner of an entity, you can update its name, mailing address, and Resident Agent, as well as file reports in the Business Summary Page. As one of the constitutional offices of the state, the Secretary of State of Kansas oversees various public and governmental functions. The current officeholder is Kris Kobach. He has been the Secretary of State of Kansas since 2011. Apart from being the custodian of the Great Seal of the State, there are numerous public affairs that the Secretary of State of Kansas takes care of. He safeguards the public archives, issues licenses and gives authorizations. The responsibilities of the Kansas SOS include electoral, economic and administrative duties.